From basic cottages and sheds with a few embellishments to more elaborate mini-mansions sporting all the architectural details, you're sure to find a free or reasonably priced plan for a do-it-yourself playhouse project among our collection of 16 spectacular designs. A few of these playhouses are for patient beginners with basic carpentry skills, some are hacks using purchased playhouses, while others specify that the projects are difficult and require advanced skills. Include the kids who will be the new "homeowners"—it's a great way to teach them valuable DIY basics, give them a feeling of accomplishment, and share a hands-on experience together. Who knows? The new playhouse might inspire you to build a tiny house for your next project, or might be where your in-laws ask to stay during their next visit! 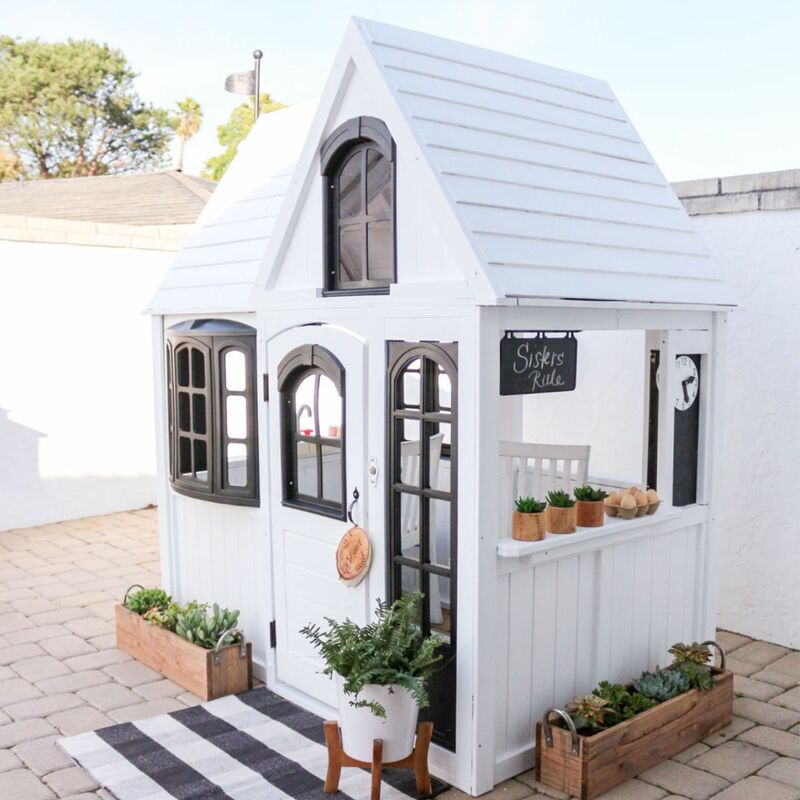 San Diego-based blogger Beth, of 1111 Light Lane, gave a Chip and Joanna Gaines-inspired spin to a purchased playhouse. Beth and her husband, Dion, used black and white paint to transform the original store-bought house into a farmhouse with personal touches, like wood planters with faux and real succulents, chalkboards, and simple extras like baskets, eggs in a crate, and a coordinating rug. Beth shares helpful tips for this playhouse hack on her blog—like using the large box in which the playhouse came as a spray paint booth! Sisters Elsie Larson and Emma Chapman write candidly about their home-based projects and pursuits on the popular blog, A Beautiful Mess. This A-frame playhouse, which recalls 1950s cabins and Midcentury Modern architectural styles is their most-requested DIY ever. Instructions are clear and include photos and in-hindsight tips, like not painting the corrugated-metal roof or buying already-painted metal; Larson says it didn't hold up well after a year. The A-frame is mounted on a larger platform deck or porch, which allows for more play space. "There is just a sense of magic about a playhouse when you are a kid. I think what makes them so special is that they are scaled to your size, while the rest of the world is mostly scaled for adults. They become your own mini-world." Influenced by traditional Malay stilt houses, Denis built a smaller version, with a roof suited for the tropical climate, harmonious proportions, and decorative, carved architectural details. His plans and photos of the project are available on Instructables. 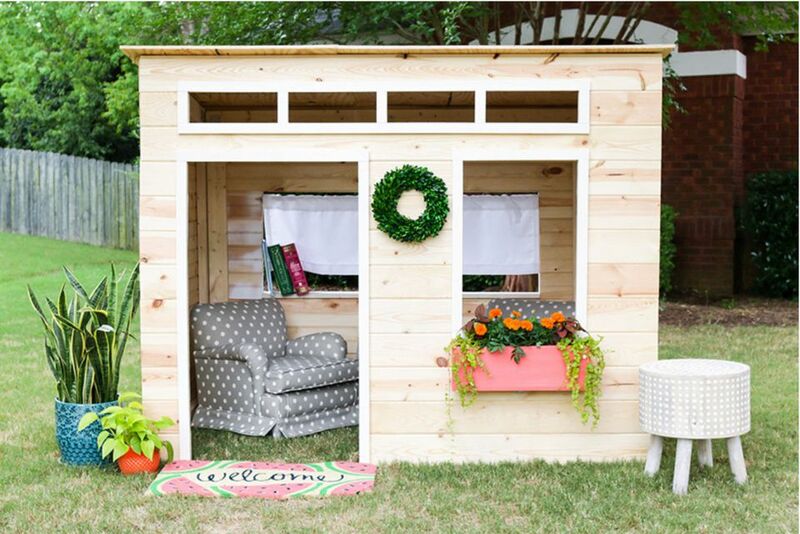 It took blogger Jen Woodhouse only two days to build this charming playhouse using 2-by-4s to frame it along with Simpson Strong-Tie connectors. She then nailed tongue-and-groove planks on the frame, painted it, added other necessities, and voila—an easy playhouse. Woodhouse writes about her projects in her blog, The House of Wood: The DIY Life of a Military Wife, and is a self-described de-clutterer. Like many military families, the Woodhouses move frequently; the playhouse will come along wherever they go. Arkansas lifestyle blogger Jennifer Maune of The Maune Legacy and her husband, Brian, followed plans to build a playhouse from Construct 101, then made tweaks to accommodate their five children. In addition to raising the ceiling to 8 feet, they added extras like electrical wiring for lighting, working windows with screens, and a porch railing, the Maunes built the house with a solid frame and roof that could withstand extreme weather and wear and tear from their three sons and two daughters. Jennifer decorated the house with pretty details like planters, lighting fixtures, and ruffled pillows. The playhouse is used for tea parties, hide and seek, and as a hideout during nerf gun battles. At Christmas, it's decorated with lights and a wreath for the front door. The charming Princess Playhouse created by Alinke and available on Instructables includes kid-pleasing features like scallops, a working doorbell, and stained-glass windows. Inside, there are built-in bookshelves, a sound system with speakers, vintage light fixtures, and Alinke's innovative Interactive Magic Mirror, a separate project that both boys and girls will love. When Keith Singer planned and built a playhouse in 1983 as a 5th birthday present for his daughter, Stephanie, he cleverly designed it to be assembled or broken down in sections: floors, walls, ceiling, and porch. Stephanie and her sister enjoyed the playhouse through their teen years—during which they used it to hold sleepovers. When Stephanie grew up and had a daughter of her own, she moved the playhouse with her. So far the house has been moved three times and can be easily transported. It's currently at the home of a family friend in Kansas City, Missouri. Measuring 8 feet by 8 feet with a 7-foot-high ceiling and 3-foot porch, the house can be customized for the tastes of your child and can be built as a clubhouse, fort, or playhouse. The downloadable booklet for the Moveable Playhouse is 30 pages and includes detailed sketches and step-by-step instructions to guide you through the building process. The Davy Jones Locker Pirate Ship is a personal favorite of Paul Gifford, owner of Paul's Playhouses, which offers a large variety of designs, such as a lighthouse, suburban ranch, townhouse, and a fortress. Gifford recommends the project for experienced DIYers with sharp carpentry skills. The ship features a crow's nest, trap doors, stairs, six shed windows, and rope rails. Barbara Butler is a South San Francisco luxury playhouse and treehouse designer whose imaginative, one-of-a-kind diminutive homes have been created for clients like Will and Jada Smith, Robert Redford, and Bobby McFerrin. If you don't have the budget to hire Butler for a custom-designed playhouse, you can order one of her six plans that range from the Cozy Cabin to the Wizard's Hideout. The Bluebird Treehouse, pictured, includes clever details like a sliding peephole, cut-outs, and a half-octagon balcony. If you're looking for something other than a cookie-cutter playhouse, think about using the plans from a vintage project book, like Sunset's Children's Play Areas from 1998. Older books with detailed instructions and illustrations can be found at used bookstores and library sales for under $3. Think about the fabulous miniature Midcentury Modern house with a butterfly roof you could build if you found a book from the 1950s or older (eBay lists Sunset playhouse books that date back to 1938). This one, the "Home Away From Home" cottage, requires precast concrete pier blocks for a sturdy foundation and suggests using redwood or Douglas fir. Have you ever searched through the online collection of The Library of Congress' Historic American Buildings Survey (HABS)? You never know what you might find, including original plans for a Shaker-style dream house. You can always use one of the plans and reduce its size, adjusting the scale to fit your yard and child. The Handwerker Gingerbread Playhouse, designed by John V. Handwerker in the 1890s, is a small Victorian playhouse built for his children and modeled after the stables that stood on the property of his home in Memphis, Tennessee. The basic floor plan exists, but you'll have to improvise—if you have advanced carpentry skills, then go for it! A shingle-style cottage with a peaked roof by Playhouse Planner is a basic design that lets the builder add his or her own personal touches, like this old door that has been modified to fit a smaller frame. With paint and architectural details that range from scalloped gingerbread trim (frieze boards) to a "Magnolia"-style farmhouse, the innovations are up to your imagination and woodworking skills. Here's a structure for the more rustically-inclined miniature home dweller. It includes a covered front porch for keeping an eye out for bears and other wild critters. This clever log cabin can be built for around $300, give or take a few dollars. Again, it's something that won't look like every other playhouse on the block, and you can retire to it when your kids have gone off to college. The projects featured on Instructables are as clever and varied as their contributors. One thing's for sure—you won't find any cookie-cutter mini McMansions here! This project has received rave reviews from readers, and instructions are available with a premium account. Plus, if you follow the directions, your playhouse will be the coolest on the block. Make that the entire city! This project is better suited for experienced DIYers or extremely talented beginners who catch on easily, interpret instructions well, and are creative. When your kids outgrow the Jungle Cruise, you can turn it into a man cave or she shed. A classic design that can be built with pine, cedar, or plywood and assembled in sections, this 6-by-6-foot playhouse is just waiting for you to personalize with paint and architectural details. Available through Grizzly Industrial, the plans are under $10. A Wendy House is the British version of a playhouse. Other than the name, there really isn't any difference between Wendy and play houses: they both are small, intended for children, and are usually built in a backyard. This particular house stands 78 inches high, is 92 inches long, and 48 inches wide, with an additional 28-inch-wide porch or deck along the front. Instructions and blueprints are included on this site, but a downloadable version is available for a small fee.